We broke out the Weber kettle grill tonight. Really, I can't think of a grill that's easier to use. With the lid and the vents, it's very easy to control this grill. It does take a little practice as with any outdoor cooker, but Weber is one of the most forgiving of all grills. 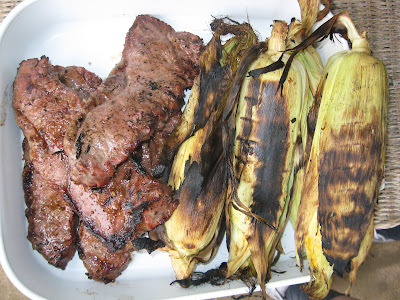 We put on New York Strip steaks and corn on the cob in the husks. Both are easy to cook and take about the same amount of time. There are fancier recipes for grilled corn on the cob, but it's hard to beat grilled in the husks corn. You don't even have to husk and silk it. Everything just falls off after the corn is grilled, and you have perfect sweet corn that just melts in your mouth with that smoked flavor. The boys love Butter Tators. Those are just frozen hash browns on the grill with butter, green peppers, and onions plus some seasonings. Yes. They are really good. Not so healthy, but we make them from time to time for a splurge. Grilled hash browns can be made on top of the grill in an aluminum pan or in a cast iron skillet, but we used the CADAC outdoor cooker this evening. The wok lid works great for the hash browns. 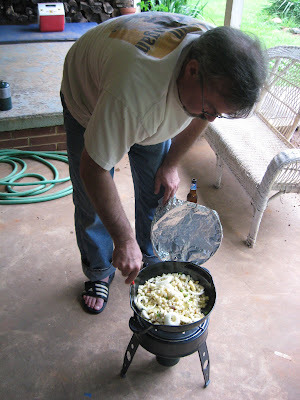 The CADAC is a really cool cooker that would be perfect for camping or tailgating. It is a gas powered cooker with five different cooking plate options. You can do burgers, steak and so on like a regular grill. We just used the wok lid turned upside down for the grilled potatoes. That kept all the cooking outdoors on a muggy North Carolina day. I had thought about giving the CADAC to my sister who likes to camp. I really don't. That is an understatement. I am not a happy camper. My sixteen year old was looking at this CADAC and asked if we could keep it. Of course. I'm always glad when my boys think something is neat. So, I'll just loan out the CADAC to my sis or any others who around here who might want to take it camping. But, the kid can hang on to this super neat cooker that will work for almost any outdoor food I can think of to cook. Yum! The steak was a perfect medium, and the corn was just right. 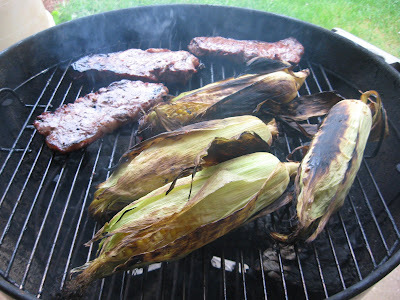 The husks may look burned, but the husks are just protecting and covering the grilled corn. Inside was yellow and juicy and very good. Nice looking meal. I'm going to have to give those butter taters a try. My boys love those butter tators (-: That's what they request all the time.